Elite Premium Class A RV Covers Maximum height 122" measured from ground to roof, excluding AC units. * Overall length includes bumper and ladder but not hitch. Elite Premium Class A RV Covers Maximum height 140" measured from ground to roof, excluding AC units. Elite Premium Class C RV Cover Fits up to 122" high, measured from ground to roof, excluding AC units. Elite Premium 5th Wheel Fits up to 122" high, measured from ground to roof, excluding AC units. Elite Premium 5th Wheel RV Covers Maximum height 140" measured from ground to roof, excluding AC units. 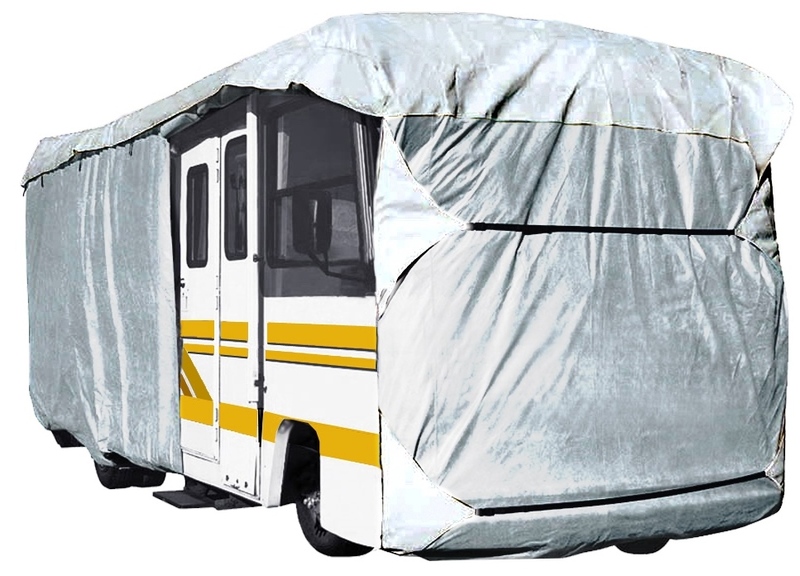 Elite Premium RV Covers are made of a UV treated, 4 layer non woven fabric that provides the best sun & UV protection. 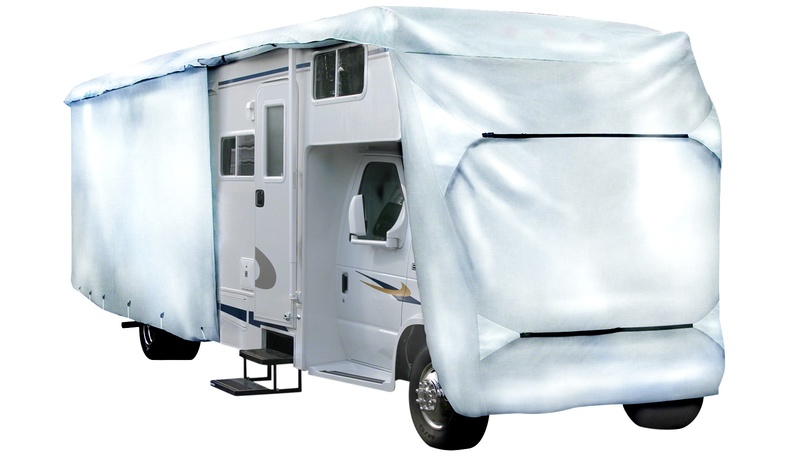 The top part is a waterproof layer with a breathable internal venting system which helps any water vapor or condensation to evaporate protecting your RV from mold and mildew during long term storage. The venting system, combined with the 4 layer top and strong single layer sides reduce wind stress and vent inside moisture. Zippered side panels allow access to your RV doors and engine areas. There are adjustable front and rear tension panels, elasticized corner hems that provide a great looking snug fit. Storage bag included + 3 Year Factory Warranty. Overall length includes the bumpers & ladder but not the hitch. Maximum height 122" measured from ground to roof, excluding AC units. WARNING! Installation is best done with two people and on most RVs requires working from the roof of the RV. Never install on a windy day or when the RV roof is slippery. Please take care when you are on a ladder or the roof. CAUTION Installation and removal is safer and easier when done by two people. Please consult your RV owners manual. Cover or tape any sharp edges on your 5th wheel that could wear against your cover. Be sure to lower any roof antennas. Unroll the cover next to your 5th wheel with the Classic logo on your cover at the front of your 5th wheel and facing the outside. Unzip the side and rear panels. On larger 5th wheels it's easiest to install your cover from the roof. Carefully climb up on the roof pulling the cover front with you. Lower the front of your cover down over the front of your 5th wheel then carefully move toward the back pulling the cover and letting it fall down the sides of your 5th wheel. Climb down the rear ladder and locate the ladder cap. (The cap helps keep the top of the ladder from stressing the cover). Fit it over the ladder top and attach it to the rungs with the hook and loop straps. Now pull the back end of the cover down the back of the 5th wheel. Zip all the panels closed on your cover and then pull the elasticized corners down over both bumpers of your 5th wheel. Locate the hook and loop straps on the upper part of the flaps that fold in under the nose of your 5th wheel. Adjust them to fit your cover to the exact length of the nose of your 5th wheel. Once the length of the nose of the cover is correctly adjusted, locate one of the supplied ropes and the D rings sewn in along the flaps that fold in under the nose of your 5th wheel. Tighten the rope and tie it off onto the D-rings located opposite each other. Repeat with the lower D-ring. Tie an end of the supplied rope onto one of the D-rings along the bottom hem. Put a small rock in the provided toss bag, close the top and tie the free end of the rope to the bag D-ring. Now toss the bag and rope under your 5th wheel to the D-ring on the opposite side. Take the rope off the bag and, allowing enough to make a knot, cut it off and tie it to the D-ring. Repeat with the other D-rings. To keep the rope ends from fraying you can carefully melt the ends with a match or lighter. Adjust the strap length on the white tension panels across the front and back to fit your 5th wheel. Cover or tape any sharp edges on your RV that could wear against your RV cover. Be sure to lower any roof antennas. Carefully climb up on the roof and take your cover out of its storage bag. Place the rolled-up cover at the front center of the roof and unroll down the center of the RV. Starting at the front, unfold your cover from the center outwards. Continue unfolding the cover as you work toward the back, letting it fall over the sides of your RV. Make sure the corners of the cover are at the corners of your RV. Climb down the rear ladder and locate the ladder cap. (The cap helps keep the top of the ladder from stressing the cover). Fit it over the ladder top and attach it to the rungs with the hook and loop straps. Now pull the back end of the cover down the back of your RV. Your cover is equipped with triple zippers on the front side panels. These zippers allow the cover to fit RVs with mirrors that do not fold against the RV. Zip all three zippers down to the mirror height, then zip the bottom zipper to the bottom of the cover. Create an opening at the mirror height by zipping the top zipper up slightly and the center zipper down slightly. Slip the opening over the mirror and close the top and bottom zippers around the mirror post. Finish by zipping all the panels closed on your cover then pull the elasticized corners down over both bumpers of your RV. Tie an end of one of the supplied pre-cut ropes onto one of the D-rings along the bottom hem. Put a small rock in the provided toss bag, close the top and tie the free end of the rope to the bag D-ring. Now toss the bag and rope under your RV to the D-ring on the opposite side. Take the rope off the bag and tie it to the D-ring. Repeat with the remaining D-rings. Adjust the strap length on the white tension panels across the front and back to fit your RV. On smaller RVs your cover can be installed with ladders but on most RVs it's easiest to install your cover from the roof. Carefully climb up on the roof and have a friend hand you the cover in its storage bag. At the front of your RV carefully remove your cover from its storage bag (The cover should be packed so that the front is at the outside of the roll) unroll the cover down the length of the roof. Drop the front of your cover over the front of your RV then carefully and slowly move toward the back or your RV spreading out your cover and letting the sides fall down the sides of your RV. Climb down the rear ladder and locate the ladder cap. (The cap helps keep the top of the ladder from stressing the cover). Fit it over the ladder top and attach it to the rungs with the hook and loop straps. Now pull the back end of the cover down the back of your RV. Zip all the panels closed on your cover then pull the elasticized corners down over both bumpers of your RV. Tie an end of the supplied rope onto one of the D-rings along the bottom hem. Put a small rock in the provided toss bag, close the top and tie the free end of the rope to the bag D-ring. Toss the bag and rope under your RV to the D-ring on the opposite side. Take the rope off the bag and, allowing enough to make a knot, cut it off and tie it to the D-ring. Repeat with the remaining D-rings. To keep the rope ends from fraying you can carefully melt the ends with a match or lighter. Don't over tighten the straps should be snug, not drum tight. To attach the straps into the side-release buckles just insert the clip into the buckle. To release the buckle press the buttons on both sides and pull the clip out of the buckle. The sides of your cover can be unzipped for access to the doors, engine or storage areas. The panels can be rolled up and held in place with the hook and loop straps toward the top of each panel. A storage bag is provided. To fit it in the bag fold your cover and roll the cover tightly rather than stuffing it. Never store a wet cover in the storage bag or confined area as the cover can be damaged by mildew. Care Spot clean with water, a mild soap and a sponge. Don't use abrasive cleaners or brushes. Three Year Limited Warranty If this cover fails due to a defect in workmanship and materials within three years from the date of purchase we will repair or replace it free of charge. Trailering or towing your RV with your RV Cover on will invalidate the warranty.